1P-LSD is an extremely novel lysergamide with no existing literature. It is a potent psychedelic with effects and dosage similar to that of LSD. Though it contains an indole moiety it is unusually substituted at the nitrogen of the indole and as a result questions have been raised about its ability to form a chromophore when reacted with the ehrlich reagent which occurs at the carbon adjacent to the indole nitrogen (C-2). Testing of 1P-LSD using the improved ehrlich reagent gave a slow reaction to light purple. In the photo to the right this can be seen alongside a comparison to tryptamine, which displays a more intense colour change. In conclusion, it is possible to verify the absence of 1P-LSD using the ehrlich reagent. A non-reaction indicates that 1P-LSD is not present. 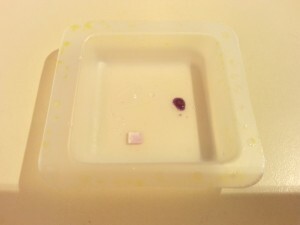 Results obtained with ehrlich reagent which is not fresh may differ significantly. EDIT: We have had a few reports and confirmed ourselves that the reaction can be extremely slow, even to the point that it looks like it’s not going to react. So it seems like the ehrlich reagent may actually be detecting traces of unreacted precursor. If none is present then we must wait for a very slow hydrolysis to give a reactive species. Tread carefully!